The Divine Mercy is a Roman Catholic devotion to the merciful love of God and the desire to let that love and mercy flow through one’s own heart towards those in need of it. Based on my research and to my facts the devotion is due to Saint Mary Faustina Kowalska who is known as the Apostle of Mercy. Faustina Kowalska reported a number of visions of Jesus and conversations with him which she wrote in her diary, later published as the book Diary: Divine Mercy in My Soul. The three main themes of the devotion are to ask for and obtain the mercy of God, to trust in Christ’s abundant mercy, and finally to show mercy to others and act as a conduit for God’s mercy towards them. 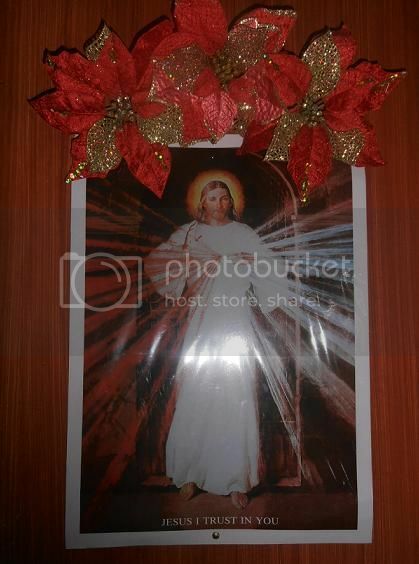 The photo below is the image of Divine mercy with a sign of Jesus I Trust In You; all of the members in MSK/Munting Sambayanang Kristiano here in our Subdivision have their own image. The Leader of Divine Mercy group was gave image to us. We also pray the 3’o clock habit every 3 o clock in the afternoon. Anyway, I also put it on the door of our room then I add poinsettia flower to make it beautiful and attractive, to the people who came to our simple abode. 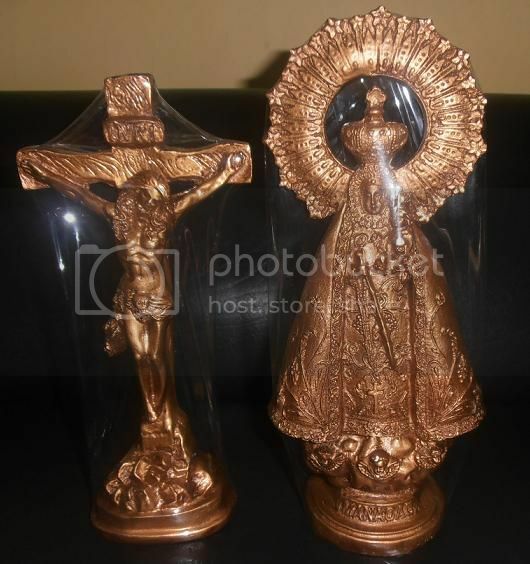 The photo below is the religious statue of Jesus Christ and Mama Mary (Our Lady of Manaoag). 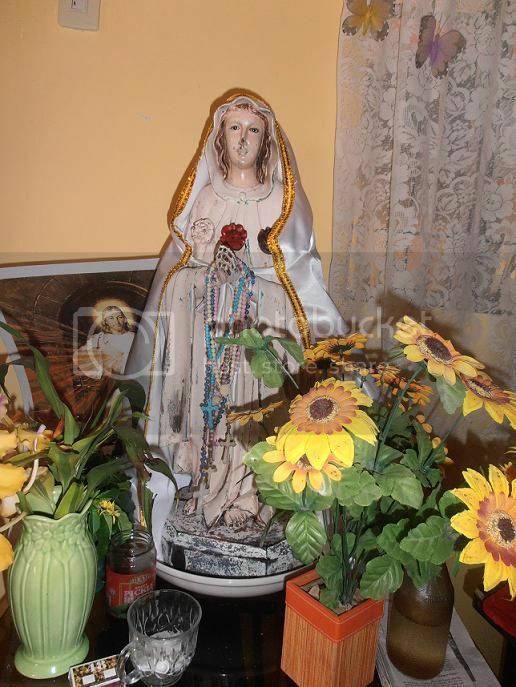 I want to share about this religious statue, one day before Christmas they have a two sister who selling their product; they told me that their product is blessed and made for the fiber glass. The statue is 12 inches tall and has a good and quality paint. And according to them if you make a wish that you give the children the Our Lady of Manaoag is the answer and your wish will be fulfilled. I am a Roman Catholic and I need to believed what their told me, because we have been married for 9 years but we still do not have children. So, I bought the Our Lady of Manaog for the amount of 800 pesos and I was pleased because the Jesus Christ Statue given me as their gift. Anyway, hopefully this year our wish will be fulfilled. And we know that in all things God works for the good of those who love him, faith him and believed him, and also we do not lose hope.